First thing on the morning of February 4, 2009, I took my bike after dropping my daughter at school and headed off to a meeting in Central London. Unusually, because there was still snow and ice on many of the side streets, I headed along the busy, main Brixton Road. Then, around 9.45am, as I approached a street called Grove Way, a silver van suddenly appeared in my path as the driver made a sudden turn from behind me into a side street. I grabbed my brakes in a panicky effort to stop - but was too late. The van caught the front of the bike, knocking it to the left. The impact sent me tumbling off to the right. I landed in the road on my elbow and right hip. I don't, however, know much more about the crash than that. Although I called the police and there was - officially, at least - some kind of investigation, I have no idea how the driver either failed to see me or miscalculated his turn so badly. I know, in fact, far less about this crash - which affected me personally - than I do about scores of crashes and other mishaps on other transport modes, where societies in Europe, North America and many other parts of the world have decided almost no mishaps are tolerable. The Metropolitan Police justified their failure to do anything meaningful about the driver who knocked me off my bike on the basis that I hadn’t suffered “life-changing injuries” - even though that was pure chance. In air travel, the maritime industry and railways, meanwhile, any failure or misbehaviour that could have posed a risk of danger to life, limb or property is thoroughly investigated and the report published, in an effort to reduce the chances of the same circumstances’ recurring. I’ve read scores of such reports over the years, awestruck by their meticulousness. The gap in standards is particularly glaring in the United States, where I now live. I’ve spent a fair amount of time this year reporting on the exhaustive efforts of the US’s National Transportation Safety Board to discover what caused the overheating of batteries on two Boeing 787 airliners in January. Although no cause was ever discovered, the incidents – which caused no injuries except a very minor one to an airport fireman – led to the grounding of the entire 787 fleet for several months. By contrast, collisions involving road vehicles – including incidents where there’s substantial evidence of criminal intent – are regarded much the same way as the weather - with an accepting, resigned shrug and a “What Can You Do?” Ray Kelly, the commissioner of the New York Police Department, made the official complacency over traffic deaths unusually explicit last week when he told Sarah Goodyear, a reporter, that traffic deaths in New York City were essentially inevitable. "We do have 8.4 million people," Kelly told Ms Goodyear. "We do have a daytime population that’s over 10 million people. You’re going to have a lot of traffic and you’re going to have accidents." Such complacency is surely a huge part of the reason why the US - which in most years suffers no passenger deaths in commercial aviation - still suffers around 33,000 road fatalities annually. It's safe to say that Ray Kelly wouldn't have thought it worth his officers' while to draw up one of the no-injury-but-potentially-serious accident reports I best remember reading. The report, by the UK's Rail Accident Investigation Branch, explores in painstaking detail what led a freight train to roll backwards for several miles in the early hours of August 17, 2010. It unearths a potentially widespread safety problem that would otherwise have gone unnoticed until something far worse happened. at 100mph in Manhattan. "Hey," asks Ray Kelly. "What else do you expect in a big, busy city?" The driver involved was on the first of a series of night shifts and had struggled to get enough sleep before starting work, according to the RAIB. After encountering caution signals, he slowed his train – a load of shipping containers – as he climbed the Shap incline in north-west England. He seems to have become drowsy and, at 2.04am, the train came to a complete halt before starting to roll backwards. The driver was still alert enough to keep cancelling warnings that he had been inactive too long or that he was passing signals. After five minutes, noticing that he had just passed a signal the wrong way at speed – the train reached 51mph – the driver applied the brakes and halted the train. Such no-injury incidents are almost never investigated on the roads. In New York, even when drivers kill people after “losing consciousness” as the freight train driver did, the police don’t seem very interested. I pass every morning on my cycle ride to work the site in Brooklyn Heights where on February 22 an SUV driver veered off the road and hit and killed Martha Atwater, a 48-year-old writer, who was coming out of a shop with bagels for her family. The driver has never, as far as I know, faced any charges. I know of no explanation as to why he swerved off the road, beyond some vague mutterings about a "medical condition". The report eventually singles out as critical to the incident's cause a factor that a typical police investigation would never turn up. It identifies that the standard railway industry model for predicting how tired certain shift patterns would make staff were out of date. It recommends that train operators scheduling staff shift patterns change them to alleviate the risk. It is entirely possible that that recommendation has prevented a serious crash since. little scrutiny as a motorist's. There’s no doubting the wider effectiveness of rigorous investigation and identification of the causes of crashes. On the UK rail system, for example, only one passenger has died in the last 10 years in an accident caused by the railway (another five passengers and a train driver died in a crash in 2004 when a driver committed suicide by driving his car onto a level crossing). The system carries well over 1bn passengers a year. Causes of scores of incidents that Ray Kelly would dismiss as “accidents” have been singled out and dealt with. Compare that with how many questions remain unanswered about what happened to me that day in 2009. The most obvious is how the driver apparently failed to see a six foot five inch man in a red jacket on an empty road, against a background that was partly white with snow. I suggested to the police that they check the driver’s mobile phone records. Only those who suffer "life-changing injuries" or death merit the cost of such a check, however. The driver who hit me was working as a contractor installing a new radio system for the police. Did his bosses expect him to answer the ‘phone when driving? How quickly did his bosses expect him to get between different police stations? Had they made reasonable accommodation for that day’s bad weather in what they were asking of him? Had they given him navigation equipment that required him to take his eyes off the road too long? The answers wouldn’t just satisfy my curiosity. They would show the driver’s fitness or otherwise for a job involving substantial driving around London, when he could threaten other people. They’re questions that relate to the working practices of everyone driving for the same employer and on the same project. New questions about traffic crashes go unanswered by the day. In New York, where I now live, the police seem to have accepted at face value the word of the driver who maimed a group of children in Queens, New York in September that he mounted a sidewalk because he mistook the accelerator for the brake. That might, however, mean that car brand has particularly confusing pedals – a fault that should be rectified. Alternatively, he might have been on his telephone, or something else entirely. It’s worth noting that the driver in the West Coast Main Line incident originally blamed an equipment fault for what happened, before investigation produced a more detailed picture. 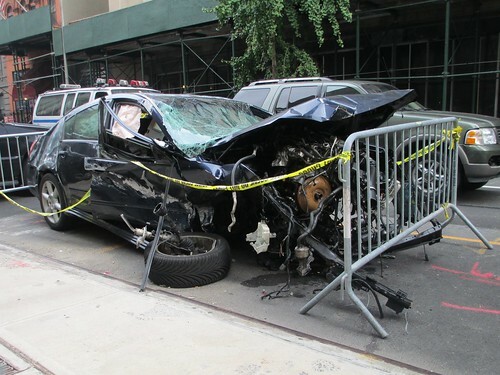 There are even more obvious questions about the suitability to drive of Mohammed Himon, the driver whose taxi severed the leg of Sian Green, a British tourist, on a sidewalk in midtown New York in August. Green herself has said Himon – who had a bad driving record to begin with – was trying to ram Kenneth Olivo, a cycle messenger, when he mounted the kerb. Himon has faced no charges of any kind and has had his taxi licence returned. Society has good reason to regulate some means of transport more tightly than others. The incident in July where a runaway crude oil train crashed and exploded in Lac-Mégantic, Quebec, wiping out much of the town and killing 47 people, illustrates the catastrophic potential of freight train runaways such as that on August 17, 2010. There are also substantial benefits to having personal motorised transport widely available to private individuals. They probably couldn’t survive regulation as tight as that of the aviation or rail industries. But there surely has to be a case for showing at least a little more curiosity about why the roads of increasingly risk-averse rich countries continue to kill so many thousands of people annually. I suspect greater investigation would show that far more crashes are avoidable than Ray Kelly or many other do-nothings suggest. I doubt public tolerance for current levels of road deaths – around 2,000 annually in Great Britain and 33,000 in the US – would survive long amid a more rigorous effort to understand the reasons behind them. I believe Sweden has committed to take traffic collisions seriously. You're right. It's called "Vision Zero," I believe. Bill de Blasio, mayoral frontrunner in New York City, has pledged to bring the approach to the Big Apple, which would be great. Of course, he has to fire Ray Kelly for that to work. But, fortunately, he has multiple reasons to give Big Ray his pink slip. One only has to look at the Asiana flight 214 crash investigation at San Francisco airport to see the contrast between how crashes with automobiles and airplanes are conducted. While we have extensive data on the actions of the pilots and the mechanics of the airplane before and during the crash, we have only the sketchiest data from the firetruck and firemen that ran over a survivor. I find it ironic that someone could survive an airplane crash only to be run over by a firetruck, and then to see how it was portrays as "just one of those things" that didn't require much further investigation. In fact, the San Francisco Fire Department wants to make it *harder* to conduct these kinds of investigations by by banning the use of helmet cams on the basis of trying to preserve victims privacy. Could you imagine airlines saying that they shouldn't need to collect black box data to protect the privacy of crash victims? That is an excellent point about the Asiana crash, which was the first commercial flight in the US to cause passenger fatalities in a long time. On the black box data point, one issue is that most new cars now have a computer nerve centre that as far as I know could tell investigators a great deal about how a car was driven in the run-up to a crash. Police don't generally bother to interrogate it. One thing I should say about most UK police forces is they're slower on the "no criminality suspected" draw than most forces in the US. The Metropolitan Police gave the guy who hit me an "informal caution" (if I recall the phrase correctly). But when I asked what this meant, the answer was that it might be taken into account if he committed another offence. In other words, it was meaningless. Excellent. For example, using a mobile phone whilst driving is both unsafe and illegal. Will legislators now pass laws requiring mobile signal disruptors in every new car? It's a good point. I've written about this in my day job. US car manufacturers are in a row with the federal authorities over how far cars and mobile phones should be integrated: http://www.ft.com/intl/cms/s/0/10ce0f52-c18d-11e2-b93b-00144feab7de.html?siteedition=intl It's far from clear the direction of travel is the right one. Excellent post - I think this has particular read across to London with the construction industry. Construction HGVs are killing a disproportionate amount of people on our roads and I'm sure a thorough investigation would reveal the reasons why (safety equipment, payment targets, mobile phone use etc etc). Thank you. A proper, systematic look at why HGVs kill so many people would indeed be revealing. They're pretty dangerous in the US too. I've often wondered the same thing myself. Unfortunately, society is not governed by logic and reason, but by perception and (occasionally poor) judgment. In this case, I believe there are two factors preventing modern society from demanding more thorough investigation of car crashes. The first is the illusion of control. 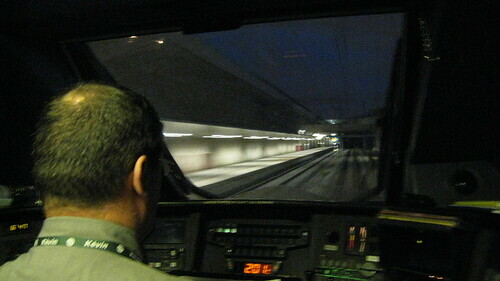 Most of society looks at airplanes and trains from the point of view of a passenger, not a pilot/conductor. They know they are not in control and cannot be in control, therefore they demand that all known sources of risk be thoroughly investigated and removed. The second is identification with the driver. The vast majority of people have never piloted an aircraft or conducted a train, but they have driven a car, and many have even driven a van or truck. Therefore they empathize with the driver and do not wish to punish the driver too harshly, for they know that next time it may be them. Given these huge psychological hurdles, I'm not sure what we can do beyond writing posts like yours and my own recent post on this topic, and advocating for changes in society based on statistics and not emotion. You're right about the illusion of control. It's also true that the potential for other modes to cause catastrophic crashes killing scores or hundreds of people is a good reason to regulate them more tightly. But I think we both agree the gap should be narrower. My own unscientific opinion of why one incident is painstakingly investigated, lessons learnt and changes implemented and the other effectively swept away with the broken glass, is corporate liability. As well as the train driver & the airline pilot, their bosses, the companies that built the infrastructure, that supplied the equipment could all find themselves in the dock having to explain why nothing had been done about a poor safety record, rules hadn't been followed etc. and ultimately find themselves in prison. In the UK if a construction company's cement truck killed a worker on a building site a full HSE investigation would follow & again the company & its directors could find themselves in court. If the truck killed a cyclist on the road outside the site, it is only the driver that would be held responsible. A mother Cynthia Barlow bought shares in cement company after a her daughter was killed by one of its trucks. She asked a question at the Shareholders AGM and the company then upgraded its fleet & hasn't killed a cyclist since. I can't find the link to the TV programme about it but IIRC the firm had killed 10-15 cyclists prior to killing her daughter but it hadn't occurred to them to do anything about it and the authorities certainly weren't going to make them. Corporate liability is a big part of what's going on here. But there's also simple regulation. The UK's health and safety laws don't cover how company drivers drive. It was a contractor at work who hit me and the company will have had no obligation to report that. If the contractor had dropped a spanner (wrench, American readers) on a policeman at the police station after arriving, he would have had to report it to the Health and Safety Executive. I don't think roads can ever be as tightly regulated as some workplaces. But I'd like to see a bit more attention paid to what's causing crashes. You are correct, although the vehicle is a workplace and Health & Safety laws do apply there, the employer's responsibility is mainly to mitigate risk to the driver rather than the risk to members of the public by the vehicle being driven (driving/rest time excepted but even that isn't investigated by the HSE). In the UK I think road accidents are an area that the HSE should be involved in, their own estimate is that 270 ksi/week involve people at work on the road. At the least they should be recording these incidents and searching for patterns that require further investigation (is there a cluster around a type of vehicle, a construction site, a firm etc) and be making recommendations to lead to further regulations/ mitigation. I read a post on Ibikelondon (http://tinyurl.com/prsncls) which highlighted that Transport for London dismissed the concerns of their consultants, the police, special interest groups and went ahead and installed poorly designed infrastructure which is directly implicated in the deaths of three people. Surprisingly the Coroner didn't see fit to question whether in doing so, TfL did showed enough duty of care to the people that use the sub-standard facilities they've approved. I'm not overly supportive of an overly litigious society but in this case, I do feel that TfL should be brought to book in court for their failings. Thank you. The Health and Safety at Work Act does cover injuries to outsiders from unsafe work practices (this is, for example, why Network Rail, is prosecuted under Health and Safety legislation for train crashes). So I'm not sure why they don't cover crashes like my one. As for the cycle superhighways, I always thought they were appallingly planned. I met TfL people regularly around the time they were going in and they didn't seem to get even little points like the fact the paint on the surfaces was dangerously slippery. It's sadly unsurprising that so many people have died. There was talk of a Health and Safety prosecution at one point over the design of a cycle facility near Kings Cross. I don't know why that isn't being raised in this case. When making my earlier comments I hadn't realised it was even being considered. Hopefully TfL will now install proper facilities, preventing future incidents and obviously any subsequent legal case. Thanks for posting that. It's at least a thoughtful response from the CPS. However, I once talked to a High Court judge about how one framed the language of a judgement and he told me the trick was to write it in such a way as to show anyone trying to appeal against it that one had considered all the relevant tests in the required fashion. That response has rather that air about it. What has happened in London is appalling. But I'm hoping that TfL, having put in inadequate cycle infrastructure and seen the consequences, will now be forced to put in better infrastructure. They can't realistically just remove cycling provision now. One wonders if the NYPD would be so understanding if one of their officers on a bike was hit by a civilian driver. In the London case, I half-wondered if the contractor's close relationship with the police might have helped him to get off with an "informal caution" or whatever phrase it was they used. But then I recognised that many others had been far worse treated when there was no ulterior motive. As for the NYPD, I think they'd take such an incident very seriously. If they found a sworn officer had been regularly rolling round town on two wheels, they'd be furious, thank the civilian driver for bringing it to their attention and get that officer down to internal affairs as fast as a squad car could carry him. As usual, you caused me to think! It never occurred to me before your post, but I wonder how seriously the "T" in NTSB takes bicycling as a means of transport. I long for the day when bicycle as a transportation article is unremarkable, unexceptional...when I no longer get the, "You biked from WHERE? I would NEVER do that. I wouldn't feel SAFE!" Sigh. p.s. If you happen to wander southward the first weekend in November, we have a Bike Summit we're putting on in Fairfax County outside Washington, DC. We have one of the richest counties in the nation, but which refuses to dedicate funding for a bike coordinator with a budget and authority to do the most good for many people. If you want to come, I'll register you as my guest. ;-) We buy lunch. You're very kind, as ever. The NHTSA, which covers car safety issues, has actually been on the side of the angels recently in resisting the car companies' efforts to turn cars into big rolling smartphones. They specifically mentioned cyclist safety as an issue in the report where they complained about the carmakers' stance. So I'll give the Feds that one. The NHTSA and NTSB have both been quite sensible about safety issues - the problem is their writ on roads issues is so limited. As for early November, that sounds lovely - but I think it unlikely I'll make it down to the DC metro area that weekend. I'll be sure to get in touch if that changes, however. I keep reading that self-driving cars are just around the corner. 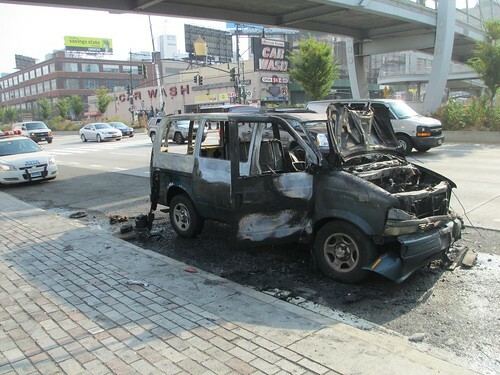 I wonder if there might be more thorough investigation of crashes involving such vehicles. Seems possible, on the "illusion of control" principle mentioned by greenwaycommuter. Self-driving cars are a very interesting element of this issue - and one I would have covered if I hadn't thought that 1,600 words was already a fairly substantial test of the patience of yourself and other valued readers. My guess is that self-driving cars will be very carefully regulated and that they really will narrow the contrasts between attitudes to risk in different transport modes. They'll be programmed to drive very safely and within a laid-down set of rules. Consequently, although crashes will become much rarer, each crash will start to be regarded as a systemic problem in the way that rail crashes, for example, already are. There's one other point - investigators will use the black box data from self-driving cars, as they already do for other transport modes. The black box from the Class 92 locomotive involved in the incident mentioned above provided a lot of the information in that investigation. As far as I know, most modern cars already record a great deal of information that would be useful to crash investigators. The police just normally can't be bothered seizing it or analysing it. Great post. On the subject of driverless cars, see this (from Adelaide, Australia) http://www.abc.net.au/news/2013-10-17/driverless-car-hits-diners-after-remote-misfires/5028950. The person that was sitting at the table in the foreground of the photo is my sister (she's OK). I'm glad your sister's OK. I guess I should have made it clear that when I said "driverless cars," I meant intentionally driverless cars. The problem is actually quite simple. The UK doctrine of 'road safety' is based on crash statistics, principally the figures for KSI (killed and seriously injured). Crashes where nobody gets taken to hospital are ignored, as are crashes causing slight injuries. 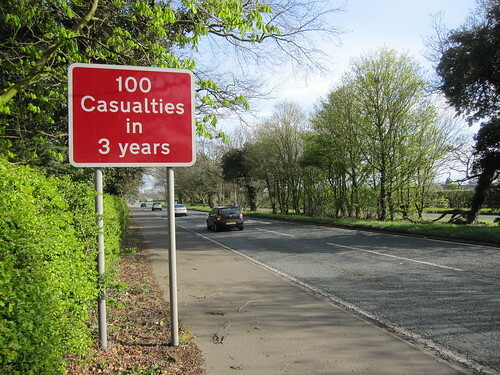 The result is that roads without a serious crash record are defined as 'safe'. I know many roads that are avoided by cyclists and pedestrians because they are too dangerous, but because there are no crashes....it's Catch-22. This doctrine of 'crash remedial measures' (as they call it here in Kent) results in an institutional bias in favour of motorists, who are encouraged to drive at any speed and in any manner they choose, providing they don't actually kill anyone. Unfortunately road safety is not a field where the conventional wisdom is challenged. Thanks for that. As you'll have gathered from my post, I do think there should be more reporting of all kinds of crashes. You're making me wonder whether my 2009 crash got recorded. I called an ambulance, so it probably did. As for conventional wisdom, you will have gathered I'm all for challenging it in this area and I'm doing my best to do so. What really annoys me is that our Governments spend so much time, money and energy on anti-terror and so little on road safety. Terror attacks in he UK have killed fewer people in the last decade than are killed on the roads each year. You're quite right that priorities can seem skewed, to put it mildly. However, I'm not sure that the effects of terrorism can be measured only by their death toll (after all, until recently the UK's annual road death toll of 3,000 or so was roughly equal to the 3,500 odd who died in the entire Northern Irish troubles). Having been in London on the day of the 7/7 attacks and in Boston on the day of this year's marathon bombing, I'd say the effect goes beyond the actual death toll. And I say that even as someone who tried suggesting to someone on a street in Cambridge, Massachusetts a few days after the Boston bombing that maybe by the standards of many other countries this wasn't that big an attack. There is one connection I would make, however. There's a steady stream of would-be bombers and other terrorists through the UK courts and, to a lesser extent, the US courts. It's regarded as unacceptable that any plot ever gets through to the point of killing people. Imagine how different things would be if the authorities took a similar approach to preventing obviously dangerous drivers from inflicting further harm. If there are limited budgets for seriously investigating incidents that don't lead to serious injuries or deaths I wonder whether it would be worth investigating a random sample of those incidents - perhaps one in one hundred. I don't know whether anyone is doing or prominently suggesting that.